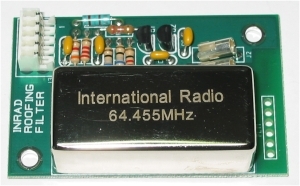 This roofing filter can help reduce the third order Intermodulation from multiple strong signals in the 2 to 20 kHz region either side of the tuned frequency. Please see our document titled "A Few Words About Roofing Filters" for more details. This mod is significantly more challenging to perform than our other roofing filter kits and requires removal of some SMT components, and modifying a shield, and putting small connectors on teflon RG-178 coaxial cables. It should only be performed by those with considerable technical skills who are comfortable working around delicate electronics and small surface mount components. 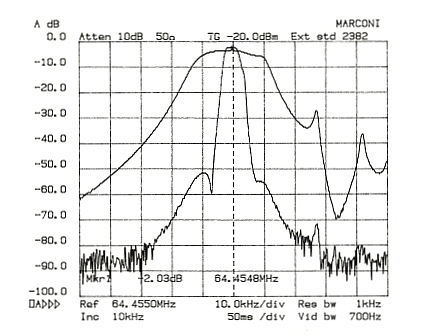 The modification may cause some frequency response variation in the band scope screen output compared to an unmodified unit. This is due to impedance variations outside of the roofing filter passband. A two resistor network has been added before the filter to minimize this effect. Note: This mod is applicable to the Pro3 only.